PibTool is a software development tool used to generate source code used to create platform independent binary (PIB) files. The current version will create Java classes, JavaBean classes, Documentation, and Fortran routines from the common PIB file specification. Click the picture below for a larger screenshot. PIB files consist of a series of named blocks. Each block contains one or more attributes. 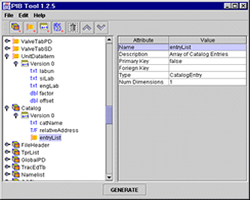 Each attribute definition includes a unique name, a data-type, a dimension rank, and a description. Data types include fundamental data types such as ints, floats, doubles, and Strings or they may be sub-blocks. The maximum number of dimensions (or rank) by data type is shown on the following table. A sub-block also contains contains one or more attributes, including other sub-blocks. The PIB file definition is created by defining a series of block and sub-blocks.